Rivendell founded (1697 S.A.) - Once the Rings had been forged and Sauron's motives revealed, war broke out in Middle Earth, the first recorded in Eriador (Beleriand is in Northern Middle Earth where the wars of the First Age were fought; Eriador is to the south). Eregion was besieged (see below) and Gil-galad sent his lieutenant, Elrond, to assist his fellow Elves. It was at this time, out of necessity, that one of the most treasured settlements of Middle Earth was built. 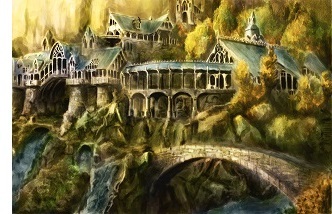 Rivendell is its name in the Common Tongue, Imladris is the Sindarin name.